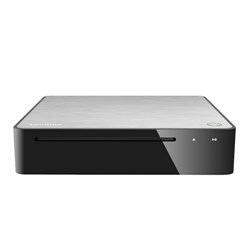 The Toshiba BDX5500KB Blu-ray player is a small black box not much wider than a disc itself, that for just under 120 GBP can take any current Blu-ray format thrown at it and decode both Dolby True HD and DTS-HD. It also outputs upt ot 2160p resolution (i.e. twice HD) which might b useful with some projection systems. In use the playback is crisp and vibrant with a natural reproduction of skin tones. It was able to keep up with all the action when playing Enders Game and sounds came through with appropriate punch. For 120 GBP that would be impressive enough but there is more. This is a Wi-Fi enabled player meaning you can also use Toshibas Smart TV offerings and whilst the range of these are limited compared to some other manufacturers this does give you access to BBC iPLayer. This seems to have some clever cacheing for whilst other platfoms we had tried this on stuttered in our test environment playback here was clear, detailed and stutter-free. In fact I would go to say this is the best iPlayer experience I've seen on any platform. The box also supports play back from DLNA compatible devices (such as PCs) on your network and is a pretty capable network music player. It has one final trick up its sleeve in that it is also a Miracast receiver allowing Laptop and Tablets that support this standard to project their screens through the BDX5500KB, I have to say we had a lot less luck with this. Many devices including Toshiba's own Encore Mini 7 wouldn't connect to it but a Microsoft Surface did. If this is important to you I would suggest testing your device first. Connections are limited on the back to HDMI, DIgital Audio (SPDIF Optical) and an Ethernet port. It is nice to see wired networking being supported as well as wireless. This worked well with a Powerline network in a home that gets poor WIFI due to old thick walls. My only complaint about this unit is the simply terrible remote control that is really unresponsive. Trying with a replacement all in one type controller gave a much better experience. Toshiba really need to replace the supplied one. Overall though this is a lot of machine for the money.